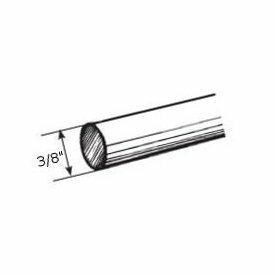 Graber Decorative traverse rods 66-120" two-way draw 1 1/2"
1-421-8: Graber Decorative traverse rod set 28-48" projects 3 1/2" to 4 1/2"
Black finished decorative traverse rod. Projects 3 1/2 to 4 1/2 inches, clearance 2 1/2 to 3 1/2 inches. Rods are metal, slides and finials are plastic. Extra slides available sku 1-428. 1 1/2 inch Windsor curtain rod. Select color from drop down box. For wide window installations and can be used with many types of curtains. Two way draw, includes 32 slides. Check our how to install curtain rods instructions in the Kirsch help section under support. Perfect traverse rod for silk curtains, cotton window curtains and many other fabrics. These decorative drapery rods are made of metal, slides and finials are plastic. Brass drapery rods are expensive, the Traditions gives you the brass look without the cost. Projection 3 1/2 to 4 1/2 inches, includes mounting hardware. Celon white traverse rod slides by Kirsch for superfine and empire rods. 10 slides per bag. White finish. Clearance is to back traverse rod and return is from front rod. Double drapery rod hardware. Clearance 1" to 1 1/2"
Return 5 1/2" to 6 1/2"
Two way draw. Superfine double drapery rods. This double drapery rods set includes 2 two way draw traverse rods for a combination drapery and curtain window treatment. Superfine Traverse Rods include drop in brackets, supports and cord tension pulley for installation. Made from heavy guage steel with a baked enamel finish. Exclusive Kirlon on all sliding surfaces. Push in brackets and extension plates are available as an option. Only the finest pulley sets are used. Strong and durable with a slide gate for easy removal of extra slides. Long wearing, stretch resistant polyester cord and continuous lacing for use at either end or to convert to a one way draw. Two way draw, extends from 30 to 48 inches. Extra long drapery rod includes 47 slides and 5 support brackets. Clearance 2 to 3 inches, return 3.5 to 4.5 inches. Sizes over 94 inches will have an oversize freight charge. Extra long curtain rods. Notification of amount will be emailed for approval before shipping. Superfine Traverse Rods include drop in brackets, supports and cord tension pulley for installation. Made from heavy gage steel with a baked enamel finish. Exclusive Kirlon on all sliding surfaces. Push in brackets and extension plates are available as an option. Only the finest pulley sets are used. Strong and durable with a slide gate for easy removal of extra slides. Long wearing, stretch resistant polyester cord and continuous lacing for use at either end or to convert to a one way draw. One way draw, extends from 100 to 180 inches. One way right, includes 41 slides and 4 support brackets. Kirsch drapery traverse rods. Superfine traverse rods, white finish. Superfine Traverse Rods include drop in brackets, supports and cord tension pulley for installation. Made from heavy gauge steel with a baked enamel finish. Exclusive Kirlon on all sliding surfaces. Push in brackets and extension plates are available as an option. Only the finest pulley sets are used. Strong and durable with a slide gate for easy removal of extra slides. Long wearing, stretch resistant polyester cord and continuous lacing for use at either end or to convert to a one way draw. One way draw, extends from 86 to 150 inches. Size 120 curtain rod solution. Kirsch drapery traverse rods. All rod can be ceiling mount drapery rods or wall mount. Two Way Draw Kirsch drapery rods, Superfine Traverse Rod includes 30 slides and 2 supports. Curtain hardware rods by Kirsch. Long lasting, worry free installations. See how to install drapery rods in the support section. Superfine Traverse Rods include drop in brackets, supports and cord tension pulley for installation. Made from heavy gauge steel with a baked enamel finish. Exclusive Kirlon on all sliding surfaces. Push in brackets and extension plates are available as an option. Only the finest pulley sets are used. Strong and durable with a slide gate for easy removal of extra slides. Long wearing, stretch resistant polyester cord and continuous lacing for use at either end or to convert to a one way draw. Two way draw, extends from 66 to 120 inches. Wall mount curtain rod bracket with 3 inch projection for 1 inch metal pole. Some colors are more than base price. Stock Colors: Black, Antique Gold, Rust. Oval birdcage finial for 1 inch metal poles. Some colors are more than base price. Stock Colors: Black, Antique Gold, Rust. Wire twist rings for curtain rod for 1 inch pole. Some colors are more than base price. Design Elements Valencia Collection of wrought iron curtain rods. Stock Colors: Black, Antique Gold, Rust. C rings for the Valencia 1" curtain rods. Some colors are more than base price. C rings are designed to allow fabric to pass by special support brackets. Stock Colors: Black, Antique Gold, Rust. Antique drapery rods for tab top curtains, eyelet curtains or pinch pleat draperies. 8 foot twisted 1 inch metal curtain rod. Looks like wrought iron drapery rods. Some colors are more than base price. Stocked colors ship in 1-2 business days, custom colors ship is 5 business days. Stock Colors: Black, Antique Gold, Rust. The Charleston Collection is a 1 1/2" iron, resin and steel decorative hardware line that is available for quick shipping. Matching brackets, rings and finials are available to finish your custom design.